The certificate ensures that the furniture are made entirely in Italy, from Italian semifinished products, constructed from top-grade, quality materials, using drawings and projects developed exclusively by the company and constructed using traditional Italian handicraft workmanship. The Institute for the Protection of Italian Manufacturers(ITPI) issued the important “100% Made in Italy Certificate” . 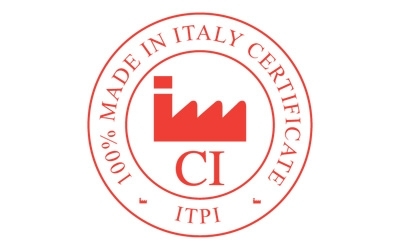 The ITPI has developed a certification system whereby manufacturers can mark their creation distinguishing them from those of uncertain Italian origin. Thus, consumers are given assurance on origin and quality. The recent sociological studies showed that the determination of the purchase by the consumer passes through a guarantee. This prestigious certificate assures the end consumer about the origin of a product. We at Presotto, for whom quality is paramount, also consider it to be a reward for the commitment and courage of such a rigorous approach to work and creativity.